Anonymous. J Spec Oper Med. 2013 Summer;13(2):1-2. La prise en charge des blessés de guerre a pour objectif essentiel d'obtenir l'arrêt des hémorragies le plus précocement possible. Parmi les dispositifs récemment proposés on trouve le garrot abdominal. On rapporte ici l'emploi couronné de succès d'un tel dispositif. Mousses auxétiques: Encore mieux protégés ! De nombreuse recherches portent sur l'amélioration des effets de protection. Le recours à de nouvelles fibres, le mode de tissage, l'emploi de plaques de céramique permettent actuellement de disposer d' équipements efficaces. Le recours aux nanoparticules est actuellement une voie de recherche, mais ce n'est pas la seule. De nouveaux matériaux ayant la propriété d'augmenter de volume quand ils sont étirés ou soumis à une pression sont utilisables. Ces matériaux sont des mousses dites auxétiques. Electricité et hémorragie non compressible ? Mandel Y et AL. Sci Rep. 2013; 3: 2111. Non-compressible hemorrhage is the most common preventable cause of death on battlefield and in civilian traumatic injuries. We report the use of microsecond pulses of electric current to induce rapid constriction in femoral and mesenteric arteries and veins in rats. Electrically-induced vasoconstriction could be induced in seconds while blood vessels dilated back to their original size within minutes after stimulation. At higher settings, a blood clotting formed, leading to complete and permanent occlusion of the vessels. The latter regime dramatically decreased the bleeding rate in the injured femoral and mesenteric arteries, with a complete hemorrhage arrest achieved within seconds. The average blood loss from the treated femoral artery during the first minute after injury was about 7 times less than that of a non-treated control. Inhalation de fumées: Héparine en aérosol ? Inhaled anticoagulation regimens are increasingly being used to manage smoke inhalation-associated acute lung injury. We systematically reviewed published and unpublished preclinical and clinical trial data to elucidate the effects of these regimens on lung injury severity, airway obstruction, ventilation, oxygenation, pulmonary infections, bleeding complications, and survival. PubMed, Scopus, EMBASE, and Web of Science were searched to identify relevant published studies. Relevant unpublished studies were identified by searching the Australian and New Zealand Clinical Trials Registry, World Health Organization International Clinical Trials Registry Platform, Cochrane Library, ClinicalTrials.gov, MINDCULL.com, Current Controlled Trials, and Google. 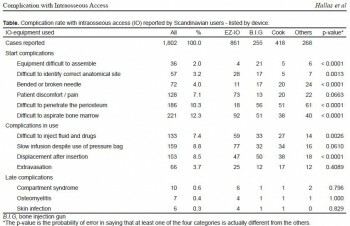 Inclusion criteria were any preclinical or clinical study in which 1) animals or subjects experienced smoke inhalation exposure, 2) they were treated with nebulized or aerosolized anticoagulation regimens, including heparin, heparinoids, antithrombins, or fibrinolytics (e.g., tissue plasminogen activator), 3) a control and/or sham group was described for preclinical studies, and 4) a concurrent or historical control group described for clinical studies. 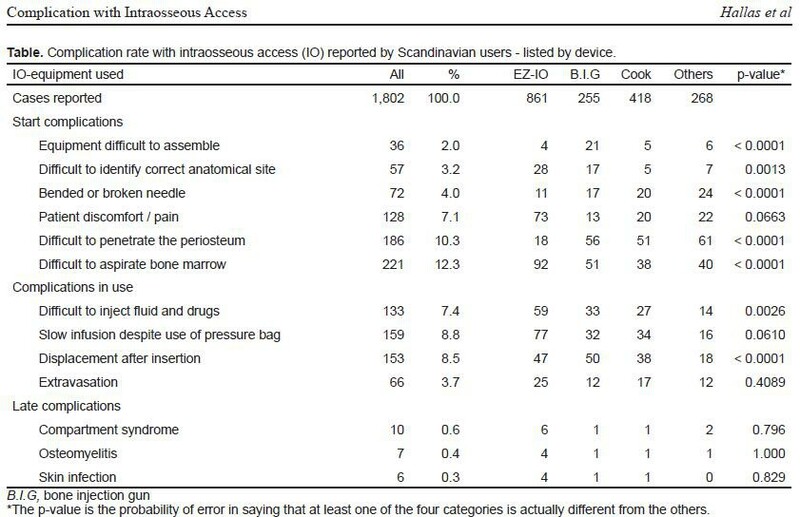 Exclusion criteria were 1) the absence of a group treated with a nebulized or aerosolized anticoagulation regimen, 2) the absence of a control or sham group, and 3) case reports. Ninety-nine potentially relevant references were identified. Twenty-seven references met inclusion criteria including 19 preclinical references reporting 18 studies and eight clinical references reporting five clinical studies. A systematic review of the literature is provided. Both clinical and methodological diversity precluded combining these studies in a meta-analysis. The high mortality associated with smoke inhalation-associated acute lung injury results from airway damage, mucosal dysfunction, neutrophil infiltration, airway coagulopathy with cast formation, ventilation-perfusion mismatching with shunt, and barotrauma. Inhaled anticoagulation regimens in both preclinical and clinical studies improve survival and decrease morbidity without altering systemic markers of clotting and anticoagulation. In some preclinical and clinical studies, inhaled anticoagulants were associated with a favorable effect on survival. This approach appears sufficiently promising to merit a well-designed prospective study to validate its use in patients with severe smoke inhalation-associated acute lung injury requiring mechanical ventilation. Depiction of airway changes in the setting of smoke inhalation–associated acute lung injury. Trachea and bronchi injury is characterized by mucosal hyperemia, increased microvascular permeability, exfoliation of the epithelial lining, mucous secretion, and an acute inflammatory cell influx (A–C) (57). As early as 1 hr postexposure, affected respiratory tract epithelium may display clumping, swelling, loss of cilia, blebbing, and surface erosion (B) (55). Within hours, sloughing of the respiratory mucosa progresses, a fibrinocellular pseudomembrane begins to form, and neutrophils begin to influx into the major airways (55). By 6 hr postinjury, the injured bronchi and bronchiole epithelium remains largely intact with focal areas of necrosis and sloughing (A, B) (56). Surface lining cells appear enlarged with cytoplasmic vacuolization, and neutrophils have begun to marginate and focally concentrate at points of epithelial necrosis (56). In addition, basal cells are normal in appearance, and the subepithelial connective tissue may appear slightly edematous with contained neutrophil infiltrates (56). By 24 hr, the ciliated and secretory lining cells are largely destroyed (C) (56). Cellular debris is admixed with fibroid material, mucus, and neutrophils creating a pseudomembranous fibrinocellular network that is adherent to both the cell-denuded basal lamina and the intact basal cells (C, D) (56). By 72 hr, injured epithelial areas are largely resurfaced by a stratified reparative epithelium with interposed areas of fibrinocellular exudate (D) (56). This epithelium is three to five cells thick, with flattened, nonciliated cells along the surface, and these cells are likely derived from proliferating and migrating basal cells (56). Subepithelial edema and inflammatory cell infiltrates begin to diminish (56). 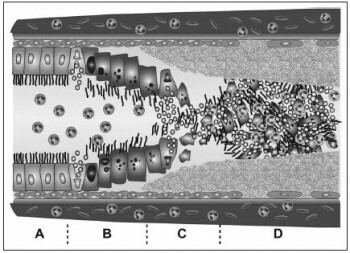 Complete repair of the respiratory tract epithelium with return of normal cilia populations may take up to 2–4 wk depending on the severity of smoke exposure.